Well Hello Spring! 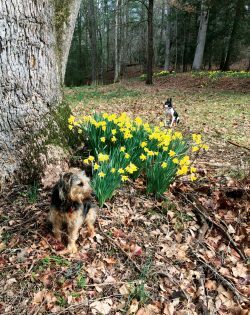 It finally stopped raining here in the north Georgia mountains (double jinx) and we’ve had typical spring weather– fresh air, sunshine and Daffodils. Perfect days for sitting outside at one of our local dog-friendly breweries soaking up some much-needed vitamin D. One of the greatest things about living in a small mountain town is that you almost always run into someone you know– and if not– just sit down at any table and make some new friends. Maxine and Billy Zoom love going to these places, meeting new people, getting attention and of course, treats. It really is that simple around here! 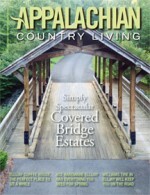 With spring just about over and summer right around the corner we’ve included some great tips in this issue from ACE hardware in Ellijay on prepping any type of garden for the coming season, from Ellijay & Williams Tire Company about getting ready for that big road trip and from Power Solutions Unlimited to keep your home safe during spring and summer storms. 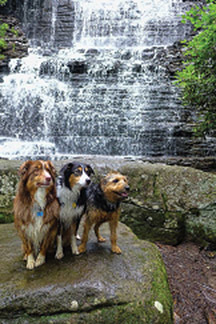 We have also featured the awesome Ellijay Coffeehouse owned by JoAnn Antonelli and Rick Lucas. Their unique style, whimsical design, great coffee and scrumptious food make this is a must stop for anyone visiting the area. The fireplace and leather couches, books and board games have made this the “Living Room” for many locals and tourists alike. Although this time of year the sunny patio does beckon. If you’re thinking about building your dream home here in the mountains and are not so much into the log cabin style, Covered Bridge Estates is surely a place you should check out. Their modern take on Craftsman Style homes is unique to this area. Bringing you the best of both worlds– gorgeous mountain views and a clean yet rustic style- what could be better? Also, in this issue is our famous list of Spring & Summer Festivals and Fairs. We pretty much double-dare anyone to try and get to them all! Just remember to check before you travel as you might guess, things around here aren’t carved in stone, you know, we’re on mountain time! We sure hope you have a great time up here in our neck of the woods.